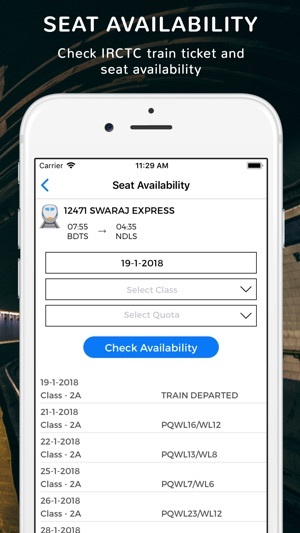 Train Seat Availability - Indian Railway PNR & IRCTC Info is your one stop app for all your Indian Railway and IRCTC train enquiry. Quickly Check the PNR Status of your Train Tickets Today! Quicker Way to Find पनर, Pnr Status, Cleartrip, Railyatri, Indian Railway Enquiry. 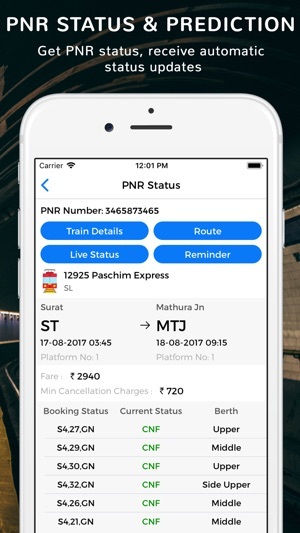 Lot's Of information regarding PNR, NTES, PNR no, Pnr states, IRCTC Enquiry, Train Enquiry, spot your train in INDIAN RAILWAYS, PNR Status, Live Train status. 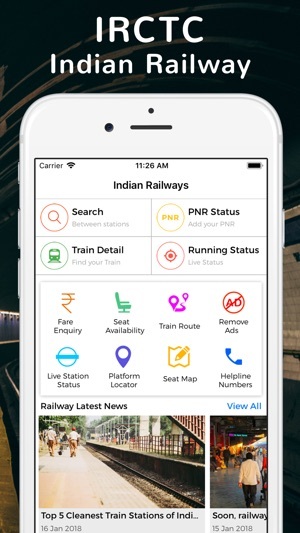 With the help of Train Seat Availability - Indian Railway (using your PNR number), you can find information related to your ticket booking status, coach number of train, a list of the passenger. Using your 10 digit IRCTC PNR Number, you can get the PNR status details. 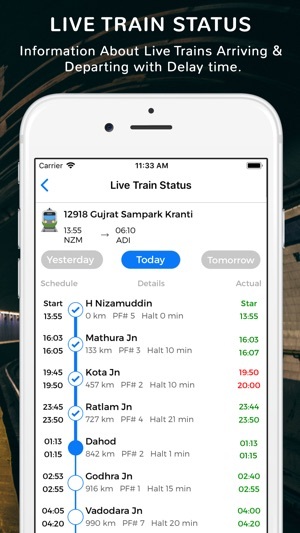 Using INDIAN RAILWAYS, PNR Status, Live Train status gets train running status, PNR status, Live train status from Indian Railways Server with great efficiency. 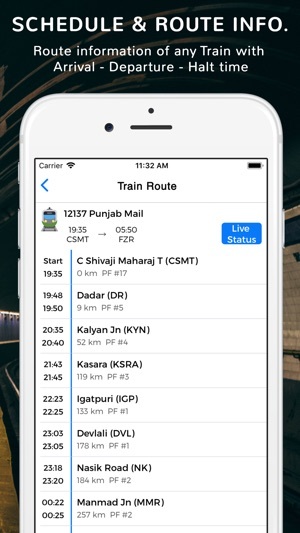 In Indian Railway train app Share live status, time tables and trains between two station with dynamic links from the app which will show uptodate information when received. 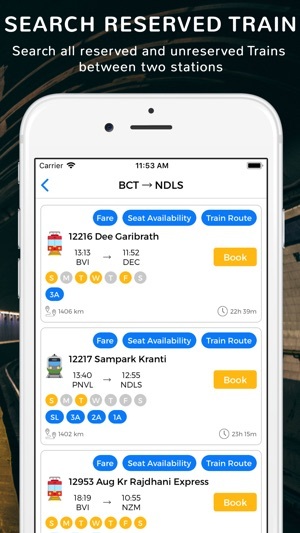 Train Seat Availability - Indian Railway PNR & IRCTC also includes IRCTC seat availability, status status, train enquiry, indian rail info, fares, train schedules, PNR Status Tracking, railway time table, IRCTC ticket booking and Destination Alarms. Indian Railway PNR & IRCTC has helped millions of Indian Railway Yatris. 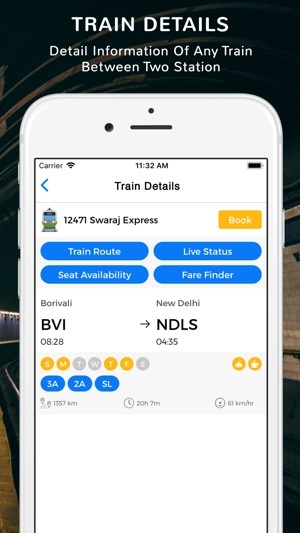 Disclaimer : Train Seat Availability - Indian Railway PNR & IRCTC Info is not affiliated with IRCTC, NTES or Indian Railways and there are no warranties associated with the app. 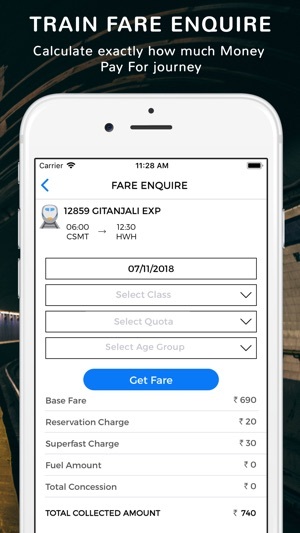 Train Seat Availability - Indian Railway app relies on public information available on 3rd party websites. 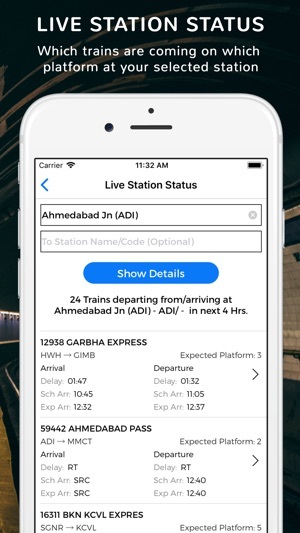 I had used first time and find it very useful when you’re traveling during your journey and you can plan to reach Rly station to catch the particular train. I had gone through various comments but people should think that we are traveling in Train not in Aeroplane. I had traveled from New Delhi to Newark in UA nonstop flight even this took 14 hrs continuous flight time and if we want in five seconds how much it traveled is foolishness nothing else. Finally it’s a beautiful designed application. Thanks to IRCTC. You make wait trains at odd places wasting more than 20-30 minutes for your own constraints, we are ok but at between stations make it minimum of 3 minutes to accommodate senior citizens to get in and get out of trains. Minimum of 1 minute stoppage is ridiculous. Every time when I take my mummy in train I go few stops beyond my requirements so that while getting down my mummy will not get unnecessary trouble, and come back to my destination by taking a cab. Irritating and time wasting adds appear again n again. See, application is average but the way it wastes my time is not a good thing. I mean every time i open it it shows me 5 second add and even I can’t skip that and while using this app I really don’t know how many time i faced dozens of adds constantly there is no skip option for them. It’s not soothing at all. This is the thing which is making me to uninstall this app and i am gonna tell others that you should uninstall this app too. So try to find a solution if you really want this app to be in this market.